If you’ve heard any sandwich chatter about Purlieu, John Zucker’s intensely awaited Westside sequel to his beloved Cru Cafe, you’ve likely heard about the burger. To say the burger makes frequent appearances on Purlieu’s social media accounts would be to severely understate the case: As of this writing, one out of every eight photographs on the restaurant’s Instagram feed depicts the burger in all its greasy-sheened glory, with cooked-down shallots melting into two teetering come-hither patties, slack as a chunky crochet beret. I’ve had the burger. I like the burger. I’m not one to argue with American cheese and a Brown’s Court Bakery bun (although, if pressed, I might argue that too much of the plate is allotted to skinny French fries, since it’s impossible to polish off the pile before they cool and lose their allure.) Still, I think the fixation is misplaced. It’s the exceptional French dip that ought to be racking up the likes and heart-eyed emojis. At Purlieu, the French dip is a showcase for thin slices of tender brisket, braised in the Parisian fashion with a classic array of carrots, onions and garlic. The beef is worlds away from what’s smoked in Texas or slow-cooked for the Seder table: Here, it’s drunk up enough red wine to taste downright poetical. Topped with fried onions that skew just the slightest bit floury, the sandwich is served split in two, with each baguette half on either side of a cup of cola-dark au jus. That au jus! Whatever cliché you like to apply to marvelous sauces that weren’t actually designed to be eaten alone holds true in describing it: Scoop it up with a spoon, slurp it through a straw. Of course, au jus is cleaned-up cattle fat, so in some ways the pleasure that ensues is remarkably primal. Yet the classical technique required to produce it is on the far opposite end of the sophistication spectrum. On those grounds alone, the French dip deserves to be considered the signature sandwich of a restaurant that doesn’t demand too much of diners (other than the patience required to secure a reservation), but consistently demonstrates mastery of fundamentals that elude more ambitious kitchens. That said, a French dip is relevant to Purlieu in other ways, too. French dips were first served at Philippe the Original, unless they were first served at Cole’s Pacific Electric Buffet, a restaurant that could have been content to claim one of the great names in American restaurant history. Determining the rightful innovator is beyond the scope of a food review. What’s clear is the sandwich comes from Los Angeles, meaning it’s only French in flavor. Such is the situation at Purlieu, which doesn’t evoke another place so much as it evokes another time. 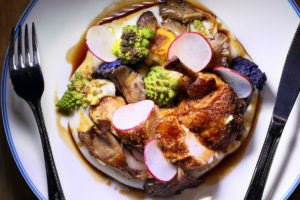 Under the leadership of chef de cuisine Jeff Williams, the restaurant is a dead ringer for the U.S. French bistros that were the ne plus ultra of domestic dining in the late 1970s and early 80s. Admittedly, I hadn’t yet come of dining age at that time (for what it’s worth, neither had Williams.) It was Proustian, though, to taste Purlieu’s hanger steak or roasted chicken and be rocketed back to sampling the leftover portion of what my parents had ordered while I was home with the babysitter. Palates are unreliable narrators, so I browsed contemporary reviews of French bistros popular toward the end of the Carter administration. The results were uncanny: Glowing descriptions of L’Escargot and La Tulipe might easily be applied to Purlieu with just a few proper noun swaps. All of this could be a cutesy way of saying Purlieu is outdated, but that wasn’t the impression I gleaned over the course of three visits. Instead, it seemed like Zucker —who lives above the dining room, in yet another throwback act — and Williams had successfully revived the valuable parts of restaurant-going that have been flattened by a fast-moving cyclone of food media and hype. For example, warm service. All of the servers I encountered were so welcoming that when they drop a box of complimentary macarons with the check, it comes across as a genuine gesture of gratitude. The only glitch on the service front is a 50-cent surcharge leveled against customers who ask for more crostini to supplement five slices accompanying an ample portion of artichoke-and-gruyere dip. It’s awkward to negotiate bread prices while riding a melted cheese high: I’d rather Purlieu just charged $17 for the excellent appetizer, and did away with the tableside nickel-and-diming. Otherwise, very little disturbs the cheerful mood at Purlieu, kept aloft by fairly priced French wine (the restaurant doesn’t have a hard liquor license) and diners sharing the compact space at Fishburne and President streets, handsomely finished with light woods and white walls. There’s something of a boat or bomb shelter feel to the close quarters, which accommodate 34 happy customers. It’s not uncomfortably tight, but it’s not the ideal setting for a private conversation either. Inevitably, you’ll fall into a discussion with your neighbors about what they ordered and how much they’re enjoying it. Early in the meal, the topic might be a sharply dressed salad of soft butter lettuce and slips of pear, buried beneath Parmesan that’s grated microscopically fine. In the salad category, it’s outdone only by a salad with colorful beet wedges, pistachios and cumulus clouds of Bulgarian feta cheese vying for the best of a terrific white Balsamic vinaigrette. Or perhaps your new friends have started their evening with what amounts to a frog leg pot pie, featuring puff pastry set atop a smattering of chopped vegetables and béchamel sauce. While its mild flavor is barely traceable to a pond, cured salmon takes a tantalizing salty turn aboard toasted triangles of rye schmeared with cream cheese. It’s almost worth ordering just to ogle the concentric circles of minced egg, tapenade and red onion, provided to further customize an appetizer already garnished with poppy and sesame seeds. Seafood isn’t always a sure thing at Purlieu: The shrimp and mussels that made up a bouillabaisse were overcooked on one occasion, although a braised triggerfish that registered as just OK on one night was stellar on another, its case helped by spunky pickled peppers and cream sauce.